Australia is broken. Democracy has holes in it, cracks in it, and it needs fixing. Since the 2004 Federal election we know that our government is not going to fix it. I think we need to do that fixing, and this blog is a start of getting some ideas together. Narrogin Sat 18 Dec 9:00am - The start of this fifth report on the Baxter hungerstrike makes for depressing reading, but I intend that to be the case. I could have easily spared you and myself this introduction, which may come across as just an unwelcome diversion into matters not directly related to the strike, but because the year is nearing its end, and previous reports have hinted at the link between what happens in Baxter and the concerted attempts coming from DIMIA to keep you fed mushrooms, I'm pressing ahead anyway. Three years ago, TAMPA was not about refugees, but about the PM, keen to manipulate himself into power in what seemed like an election he was going to loose, and it was about his obligations to inform Australians instead of manipulate them. TAMPA was about government accountability, and a government's absolute duty to promote openness, transparency and all other issues related to what we call 'democracy'. And the issues are still the same. This weekend Alan Ramsey in the Sydney Morning Herald shares with his readers a Christmas message, and he lists a few alarming issues from 2004 using the Eureka Stockade theme as a "christmas wrapper" for his message. In his opinion piece Ramsey shows us some large gaping holes in Australian democracy as expressed in openness, honesty and accountability of elected government. Margo Kingston sums up her expectations of the erosion we can expect in the Senate from July next year in this Web Diary write-up - it left me with a feeling of being seriously alert and alarmed, to keep it in the style of the fridge-magnet. Justice Michael Kirby, in accepting an honorary degree at Australian National University this week, warned his audience in his acceptance speech that the sum-total of the work of the Australian High Court "makes for depressing reading", and you get the impression that Kirby is seriously worried about democracy and justice in Australia. And because most of Kirby's examples were from within our own sphere of 'interest' - refugees and asylum seeker cases - I was doubly worried: it seems evident that politicians have more sovereignty than the courts, especially in relation to detention and deportation of asylum seekers. In The Age, Pat Dodson and Noel Pearson show their serious concerns, and openly issue a warning to the Prime Minister about his social engineering attempts with his Welfare for Showering Yourself with Soap policy. And finally, in The Australian, Moira Rayner, who I call "the banished one from WA" (WA Premier Geoff Gallup sidelined her as Acting Equal Opportunities Commissioner as soon as he came to government because she was going to be too open about Indigenous issues) opens up the can of worms about Indigenous housing in WA, one that Gallup wants to keep closed pretty badly, especially a few months before the State election. And that's not all. Today I'm thinking of the Bakhtiyari family as DIMIA once again engages its Compliance Branch - on a weekend as usual, and more so, at the start of the convenient Christmas season - which to me bears all the hallmarks of the German Gestapo, especially because its actions are clouded in secrecy, and in the case of the Bakhtiyari's swiftness of action and secrecy is even more predictable - because what should be avoided at all costs is legal action, which may well expose Immigration as being complicit of falsifying documents. See Sarah Stephen's work in Green Left Weekly (article also posted below): none of the mainstream media had the courage to touch it. They were happy to spend a small fortune on international travel and "investigative journalism" to discredit the family, in particular Ali, the father, but they have shown no interest in investigating errors made by our friends in DIMIA and their information spin in what reminds me of that hideous Gestapo. The six kids and Roqia were moved from Adelaide to Port Augusta at seven o'clock this morning. Our warning bells rang yesterday when the minister broke with her undertaking, previously given to the courts, to give the family 48 hours notice before any deportation action would be undertaken, and made sure the media knew about it. I referred in the Fourth Report to Your Right to Know in relation to the continuing misuse by DIMIA of the right to privacy of detainees and asylum seekers when it conveniently extends its right to exercise this privacy, demeaning it when it simply spins to the press generalisations and information that amount to lies about the Iranians involved in the hunger strike: the example below is about DIMIA denial that a "police negotiator" assisted to get the three men off the roof, while the messages from detainees and hunger strikers keep rolling in, telling us the exact opposite (we also received a name, see below). Nothing has changed since Tampa, when even the most minute information "spill-over" was tightly controlled from John Howard's Department - lest the voters would hear a whisper of facts from asylum seekers and their human story. As an example of the net effect of Howard's continuing manipulation of Australia in the media, take Senator Andrew Bartlett's press release, detailing his resolve to start a hunger strike in solidarity for the remainder of the time that the Iranians keep going with their gruelling action at Baxter (Bartlett's news is also part the 4th report). Within hours of his media release, the news appeared at Reuters and the US ABC online (thanks to international correspondents Michelle Nichols and Kylie Scott, who are based in Australia) yet we're yet to see any mention of it at News Ltd, which usually spawns a string of articles in the Murdoch press. The Australian, see below, refers to this extraordinary step by the Senator but does not see the need to give you more than one line about it (we spotted a terrific logo for The Oz here) and The Advertiser as the daily paper of Baxter's Home State, devotes just three lines to the end of the rooftop protest under the misleading headline of "Detainee strike ends", omitting that more than 20 Iranians have just confirmed their resolve to remain on the strike. Hundreds of news articles have appeared in Australian and International media about the Bakhtiari family since Andrew West revealed the story of the family in the Sun-Herald in February 2002, shortly after their uncle, the now deported "crown witness", clearly a Hazara from Afghanistan, jumped on the razor wire at Woomera. At Project SafeCom, we collected them all (well, most of them). They are brought together in four WORD documents, zipped up for security from viruses. Simply use the "Right-click, Save As" command of your mouse on the images or on the linked text. THE prospects of the Bakhtiyari family being deported increased yesterday after Immigration Minister Amanda Vanstone reneged on her promise to give 48 hours' notice before issuing orders that the asylum-seekers were moved. Representatives of the family fear Roqia Bakhtiyari and her six children could be transferred from community detention in Adelaide as early as this weekend, and detained in the Baxter facility in the South Australian desert. Roqia's husband, Ali, is already in detention at Baxter. A letter from the Australian Government Solicitor carrying yesterday's date cancelled the agreement between Senator Vanstone and the family's lawyers. "The minister had instructed that you be given 48 hours' notice of any substantive changes to ... detention arrangements. "We advise that the minister now withdraws her 'undertaking' to you," says the letter, signed by senior executive lawyer Katherine Bean, obtained by The Weekend Australian. Faced with the prospect of deportation, Mrs Bakhtiyari was considering negotiating with immigration authorities to allow her school-age children to remain. Principal Greg O'Kelly, who teaches Alamdar and Muntazer Bakhtiyari at Adelaide's St Ignatius College, pledged to "nurture" the boys should their parents be deported, saying the school could provide accommodation. "They have turned up every day, they have excelled and they should be allowed to complete their schooling with no more dislocation," Father O'Kelly said. The developments concerning the family occurred as Victorian senator-elect Steve Fielding declared he was ashamed of the Government's treatment of asylum-seekers. Mr Fielding, who will become the first federal senator for Christian values party Family First on July 1, has called for an "urgent summit" to review the issue of long-term mandatory detention. Responding to a 13-day protest by long-term Iranian detainees camped on the roof of the Baxter gymnasium, Mr Fielding said the Howard Government needed to show some compassion as well as a tough stance on border security. Family First was in "dialogue" with the Prime Minister's office, and would meet John Howard in the next few days, party federal chairman Peter Harris said yesterday. The roof-top protest was resolved on Thursday night after a South Australian police negotiator was called in and the protesters agreed to come down. However, a spokesman for the department said the situation remained "of concern", with 15 detainees continuing a hunger strike. Democrats senator Andrew Bartlett will begin a hunger strike today in sympathy with the plight of the detainees. In June 2002, the Australian immigration department claimed to have proof that Afghan refugee Ali Bakhtiyari was actually a plumber from Pakistan called Ashgar Ali. In December 2002, Ali's temporary visa was cancelled and he was re-detained. That same month, Afghan refugee Mohib Sarwari's temporary visa was also cancelled on the accusation that he was Ali's brother, a Pakistani by the name of Ghazanfar Ali. Sarwari had been living quietly with his family in Launceston, Tasmania, and had never met Ali. The accusation fell apart when refugee lawyer Marion Le went to Afghanistan to find the Sarwaris' village and returned with proof that they were Hazaras and had lived there until they fled to Australia. Despite this revelation and the doubts it raises about the accusations against Sarwari's alleged "brother", Ali remains in Baxter immigration detention centre to this day. 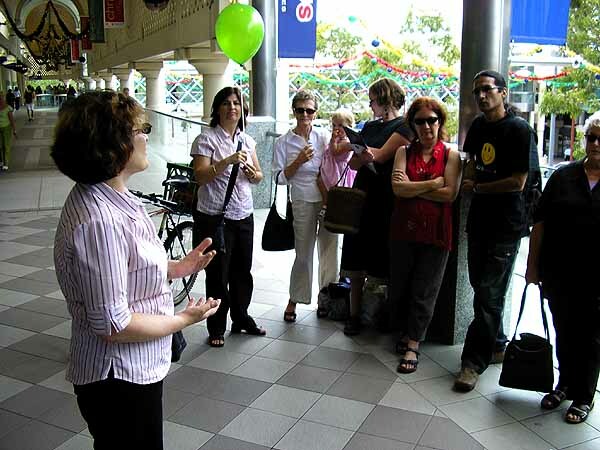 In 2002, the Coalition government responded to growing public disquiet at the treatment of asylum seekers by launching a systematic campaign to attack the credibility of Afghan refugees seeking asylum in Australia, claiming they were Pakistanis posing as Afghans. Newspaper headlines immediately promoted this unsubstantiated slander. The July 22 Sydney Morning Herald's front page story was headlined "Fake Afghans caught in migration net" [by Neil Mercer, formerly located here]. 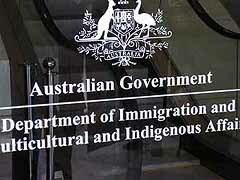 In an interview on the ABC's Insiders program on August 25, 2002, then-immigration minister Philip Ruddock claimed that some 700 people "claiming to be" Afghans were being investigated by the Department of Immigration and Multicultural and Indigenous Affairs (DIMIA). The Bakhtiyari family developed a high media profile at a time when the refugee issue was centre-stage in Australian politics. Ali's wife Roqia and their five children were in Woomera detention centre with Roqia's brother Mazher Ali. In January 2002, during a hunger strike in Woomera, Mahzer threw himself onto the razor wire surrounding the camp to call attention to the family's plight. He nearly sliced his jugular and required 100 stitches. In June 2002, Alamdar and Montazar Bakhtiyari, then aged 14 and 12, escaped from detention and were on the run for three weeks. Amid international media attention, they took refuge in the British consulate in Melbourne, unsuccessfully sought asylum in Britain and were eventually returned to Woomera. The following day, Ruddock announced that DIMIA had informed Ali in April that it intended to cancel his visa due to its claim that he was really Pakistani plumber Ashgar Ali. Making such an announcement the very day after images of tearful children in detention were beamed across the world appears to have been an attempt to undercut any developing sympathy for the Bakhtiyari family. The document DIMIA cited as proof of Ali's identity was a 1975 Pakistani application for registration with a photo attached, obtained in August 2002 by John Caspersson, a DIMIA compliance officer in Islamabad. Supporters working on Ali's case have identified three versions of the same document, all with a slightly different photo, despite assurances that the original document was photographed only once. One photo has flash spots in the eyes; another photo is attached at a different angle on the page to the others. An appeal under section 417 of the Migration Act was submitted to immigration minister Amanda Vanstone in June this year, calling on her to exercise her ministerial discretion to reinstate Ali's visa. It was accompanied by an affidavit signed by Hassan Ghulam, president of the Hazara Ethnic Society in Australia, who was asked to examine the Pakistani identity document to determine its authenticity. In a detailed description of all its inconsistencies and omissions, Ghulam said that "an authenticity test of the original document did not take place" and that many parts of the document had not been translated. In Ghulam's opinion, "the document is false, and a lot has been fiddled with. It is not reliable and does not belong to Mr Bakhtiyari as a genuine document for proof of his identity." However, there has been no response to the appeal. A number of other Afghan refugees whose visas were cancelled on grounds of identity fraud had them reinstated, on the ground that the Pakistani documents used to allege identity fraud either appeared to have been tampered with or could not be authenticated. In one Refugee Review Tribunal appeal on April 15, 2003, RRT member Kim Rosser noted that the grounds for cancelling the applicant's TPV included an anonymous letter and a photo of a Pakistani National Identity Card. Rosser was unable to conclude that the photo on the NIC was of the applicant, given that it was taken up to 20 years ago and the person in the photograph did not appear to be so many years younger than the applicant. According to Rosser's findings, the photograph was "much clearer and brighter than the rest of the document" and contained other anomalies. "I consider it possible that the photograph is a recent addition to the document and is not the photograph that was originally on the document." The refugee's visa was reinstated. EK is another Afghan refugee whose visa was cancelled on grounds of identity fraud, after DIMIA decided that he resembled the passport photograph of a man called Muhammad Anwar. The Pakistani passport was among documents seized by Indonesian police when they intercepted asylum seekers in November 2000. DIMIA claims that it subsequently obtained from Pakistani authorities Anwar's application for a Pakistani NIC, lodged in 1978. At the time, Anwar was 22, which would make him 49 years old today. EK is only 30 years old! EK has been detained in the Baxter immigration detention centre since August, and has a RRT hearing in mid-December to appeal his visa cancellation. While the government tried to create the impression that there was widespread fraud among Pakistani migrants posing as Afghan refugees, the number of visas eventually cancelled was very small. On February 17, immigration minister Amanda Vanstone confirmed in parliament that a total of 27, or a tiny 0.8% of all Afghan TPV-holders, had their visas cancelled on the grounds of identity fraud. Who knows how many of these refugees were victims of fraudulent documents that did not belong to them. Even a suspicion that documents may have been forged to strip some Afghans of their visas should have thrown every allegation of identity fraud into question, but it did not. There have been no exposes in the press, no Senate inquiries and no police investigations. DIMIA's case against Ali wasn't limited to the Pakistani documents. The department also worked hand in hand with a number of journalists to sow further doubt about Ali's identity. Some went to Pakistan to find "evidence" and others went to Afghanistan. In a July 28, 2002, article in Sydney's Sun Herald titled "He's from Pakistan and he used to repair our pipes", Matthew Behns alleged that Ali was really Ashgar Ali, a pipe fitter from Pakistan. He claimed he was educated, four years older and that he had a different family. The story carried a picture of a plumbing shop purportedly in Quetta with a picture of Ali above it taken in Sydney. This was interpreted by many as Ali in front of his alleged shop. Writing in the August 2, 2002, Sydney Morning Herald, two weeks after the Bakhtiyari boys' attempt to claim British asylum, Alan Ramsey claimed "evidence builds that Ali is not who he says he is". Some details in the article were only available from the Bakhtiyaris' DIMIA files, indicating collaboration between Ramsey and DIMIA. Ramsey quoted extensively from DIMIA's initial decision to grant Ali a visa on August 3, 2000. According to Ramsey, DIMIA thought he could be "Ali Bakhtiyari, Haja Ali Aghisar or Ashgar Ali Bakhtiyari, a Pakistani plumber and gas fitter who reportedly owned shops in Kuwait and a gas company and/or a plumbing business in Quetta, Pakistan". DIMIA couldn't even decide who it thought Ali was. On July 26, 2002, the Australian carried a map showing the location of Ali's village in the centre of Afghanistan's Oruzgan province. The Australian's Alastair McLeod went to Afghanistan to verify Ali's story. On August 14 he described how nobody recognised Ali's photo when it was shown around in the village. It is quite likely that McLeod was in the wrong area. According to the map accompanying his article, McLeod was in the north-eastern corner of Oruzgan and he refers to the village being high in the mountains. However, Ali says his village is in a valley. The Age's Russell Skelton also made a trip to Afghanistan that year, but it appears from his map in the August 23 Age that he also went to the wrong part of Oruzgan province. Skelton also claimed to have showed Ali's photo to villagers, who said they didn't know him. According to Dr William Maley, who has appeared as an expert witness in a number of other cases of identity fraud involving Afghan refugees, there are many reasons why villagers' claims not to know a person should be considered unreliable. In particular, when strangers or government officials enter a village, the locals often say they don't know the person in question in order to protect him or her, due to justified suspicion of the intention of those asking the questions. Despite the contradictions, factual inaccuracies and serious lack of evidence to support the journalists' claims, they assisted the government in sowing serious doubt in the minds of even the most sympathetic. Following Mahzer Ali's forcible deportation from Australia in July 2003, he obtained documents proving that Roqia Bakhtiyari was from a village in the Jaghoori district of Ghazni and that all her children were born in Afghanistan. Her identity was confirmed by the residents and the statement signed by the district governor. DIMIA has told Roqia that it now accepts that she is Afghan - or at least is no longer certain that she is Pakistani. DIMIA offered to grant permanent visas to her and her children if she agreed to divorce her husband. Roqia and her children are currently living in home detention in Adelaide. Skelton visited Baxter in July 2003 and met the Bakhtiyari family for the first time. Roqia, Alamdar and Montazar have all recounted to friends how Skelton offered to change his story about them. In the last week of November, Ali came under pressure to sign documents agreeing to his removal from Australia. He has few avenues left to appeal the cancellation of his visa. THREE detainees at the Baxter Detention Centre have ended a rooftop protest. The men had been on the roof of the centre's gymnasium for more than a week and had refused food in protest at their detention. An Immigration Department spokesman yesterday confirmed the three had ended their protest overnight. One: (11.00am, Fri 17/12) Just had a call from the guys. All are back from hospital and in the compound. They say they had a visit from Adelaide Police and from GSL Management in Canberra, who threatened to move them all into Management Unit (ie: solitary confinement) if they don't break the hunger strike. They're determined to go on with it, claiming it was their right to do with their body as they wish and that they had not committed an offence or hurt anybody, so no reason to move them to management. Personally, I'm surprised it hasn't already happened. Two: (11.15am, Fri 17/12) I just had a phone call from one of the Baxter hunger-strikers. The police have moved into Baxter and GSL is threatening to use them to break the strike and put individuals into isolation, if they continue with the protest. I was asked to pass this news on. Three: (7.00am, Sat 18/12) There has been an Iranian man, visiting with a GSL person on Thursday and Friday; he said he was a policeman from the South Australian police and had been brought to talk to the guys. Now they are very worried that he's connected to the Iranian government, as he had no ID and they have told him things including their names. He said he had lived in Australia since he was six. His Farsi was very good indeed. His name is Mehrdad Yazrlu. Thanks to the Melbourne Indymedia folks we have some photos of the Melbourne fast. Note: Arnold Zable asked for this action not to be called a hungerstrike but a "fast". Coordinated by SMS from hunger-strikers in Baxter, simultaneous protests were held at DIMIA offices around the country. Around fifteen people converged at Crazy Clark's in the city and loitered around, until we figured that DIMIA nextdoor would be a better place to protest... especially considering the Iranians currently on hunger strike in Baxter. 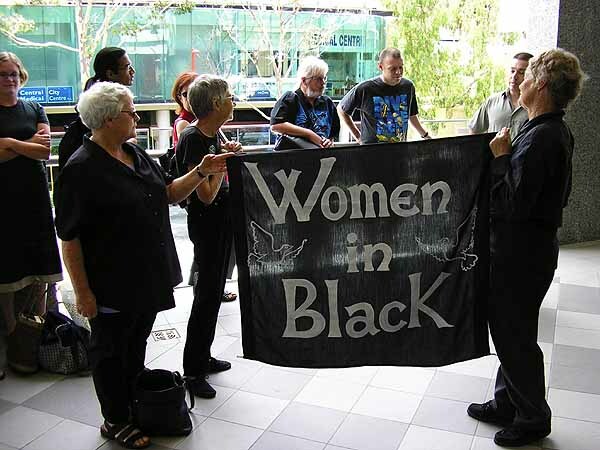 Amongst the protestors were the elderly militant cell known as "Women in Black". 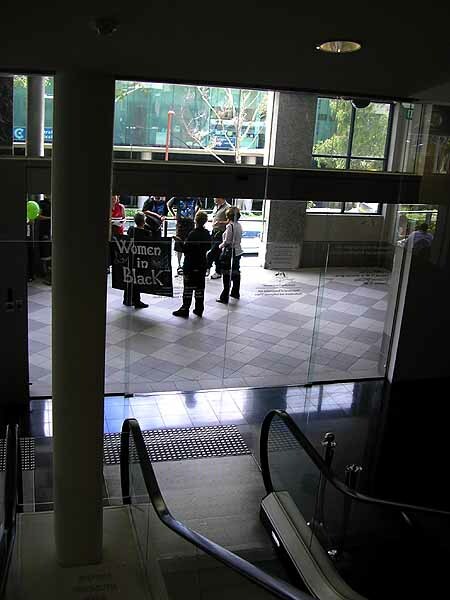 As passers-by blissed out in xmas consumerism, the protestors gave speeches to one another... then, led by the militant "Women in Black", a small breakaway faction infiltrated the DIMIA office, and proceeded to queue up in line. "Yeah, hi, we were just wondering if we might be able to speak to anyone about the situation in Baxter at all..."
The infiltrators' polite and courteous manner belied their terroristic ambitions. The walls of the DIMIA waiting room were covered with colourful murals featuring "welcome" in 20 languages, which of course only served as a backdrop to the "Terrorist Hotline" and "Immigration Dob-in Line" advertisements. Another sign said "no cameras", so of course, I had to take a photo of that. The counter-lady was flustered and didn't know how to handle our enquiry until a supervisor intervened to let us know they would try to find someone to talk to us. Little did we know the police had been called. During our 20 minute wait, I proceeded to steal DIMIA's xmas decorations... After all, they ain't bringing anyone any xmas cheer. (See DIMIA tinsel modelled by anonymous radical in the photo below). The head of DIMIA in all of WA emerged and without so much as a greeting, she proceeded to state, "You have no business being here, I ask that you leave now. The police have been called". "But... we're just doing our duty as citizens. Whatever happened to democratic, accountable and transparent governance?" "Yeah, it feels a bit like Stalinist Russia. What are you hiding?" "Do you even know that there are people on hunger strike at the moment in Baxter? Do you know people have been in there for 6 years? In the desert, with no charge? What are you doing to these people?" The DIMIA chief met our enquiry with silence. DIMIA workers and immigrants in the waiting room eavesdropped into our melee. "You can put your tape recorder away now!" the DIMIA chief yelled at me. Her aide then corrected her. "You know, its not a tape recorder, it's a camera, which is strictly banned here. Please put it away." To which I responded, "Smile!" and took a snapshot of our wonderful democratic, accountable and transparent public servants. He he he... (See photo below). As the cops were on their way, we decided to leave. "We'll be back" we told the bigwigs. "And we'll bring ten times the amount of people". "Well, look, there's a 1300 number and a website. If you want information, you can go there, through the proper channels. This isn't the time and place. You've had your fun, now everyone's happy. Goodbye." "Yeah, everyone's happy" I mimicked sarcastically, "except our brothers and sisters in Baxter". The cops rocked up as we were leaving. They were extremely dismissive of DIMIA. "Jeez, they told us there was a protest, and we come rushing and, what?, there's just you guys? hahaha... I mean, I can sort of see where you guys are coming from. You just wanted information. Where else are you supposed to get that sort of information?" Was this the embryonic stages of a police mutiny? Just a wee bit of feedback - a couple of us, Me, Marco and some Women in Black thought we would just drop in in a very non-confrontational manner to DIMIA this arvy, politely wait in queue and ask to speak to someone about our concerns with the Iranian hungerstrike situation. The head honcho woman was actually really threatened by us and told us to leave, despite our reasonable request to just make an appointment, even if it was on another day. They advised we would need to go to the website or call up to make an appointment and said they had called the police. As you know the Women in Black are a well organised terrorist group and are quite physically frightening so i don't blame them. My suggestion is EVERYONE calls up individually and tries to make appointments, if not able to then individually go into DIMIA every day - take turns etc and ask to speak to someone about the issues ... perhaps someone could forward this to other state groups. Four Launcestonians will publicly declare their solidarity with the long-term detainees in Baxter from 8am on Wednesday, December 22nd in Civic Square, Launceston. Professor Robert Bland, Gregory Stephens SSM, Sally and Christopher Strong will peacefully fast and offer a vigil of protest, hope and Christian witness following recent visits to Baxter Detention Centre in South Australia. Just as the World Vision 40-Hour Famine allows individuals to express solidarity with the world's poor, so this Vigil and Fast allows these four citizens to express concern for men, women and children held by our country in detention prisons for many years without criminal charges and against their will. Christopher Strong, spokesperson for the group, said: "These people are triple victims - persecution and danger in their own country, then exploitation by people smugglers, and now we are responsible for further inhumane treatment." He went on to say: "While we acknowledge the government's right to make policy and the deterrent effect of the present policy, it is now time to address the unintended consequences of that policy. These regrettable consequences can be handled so as to create win win win results. We appeal to our government to seize this moment of opportunity". Those supportive of the peaceful purposes of the vigil or wishing to share their sorrow and their stories, are invited to visit the vigil. This document explains the purpose of the vigil and fast. It is not a political attack or act of religiosity. 1. We seek to encourage people to greater information, understanding and reflection upon the circumstances of those in detention. 2. We want to challenge all people of conscience, and especially Christians in all churches, to play an active role in seeking social justice for long-term detainees. 3. We appeal to all Australians to act as agents for change to bring about the intention of this vigil through democratic processes. 4. We want to give hope to people held in detention. We want to assure them that many Australians care deeply about their suffering, and are working to seek change. 5. We appeal to our government to find avenues to solve this damaging and dangerous situation. 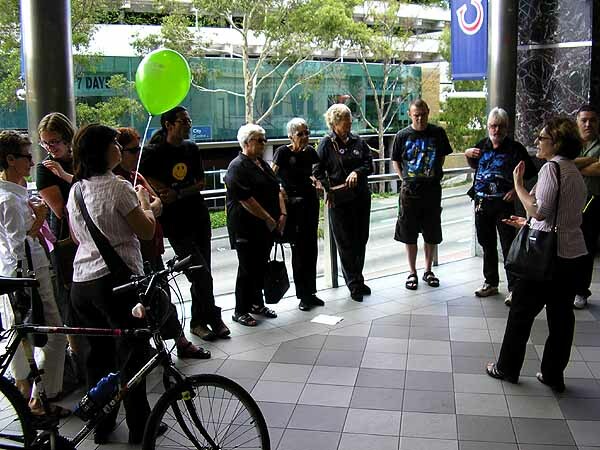 The Pilgrim Circle of Friends based at Pilgrim Uniting Church, in the heart of the CBD of the city of Adelaide, has been conducting a Vigil (which commenced on the 13th Dec 2004) in support of the Baxter detainees on hunger strike. This has been going daily all through this week and will continue into the forseeable future as long as the hunger strike continues. On behalf of Asylum Seekers at the Baxter Detention Centre taking extreme measures out of their despair! We would like as many people attend as possible to show solidarity. Come at any time during the hours indicated and stay whatever time you can. Besides quiet prayers, lighting a candle ... those of other persuasion may spend the time writing Christmas Cards to detainees or protest letters to authorities. Some materials are provided. For people coming off the street we are providing printouts of the latest news from PROJECT SAFECOM (for their education). "As a visitor to Baxter this week it was distressing to hear of the lack of trust which may have contributed to the protest. Those on the roof would not accept drinks from GSL or DIMIA staff, for fear it would contain a sedative allowing them to be brought down. One detainee (at least) who took water to them was placed in solitary confinement. So much for the act of a 'Good Samaritan'." "On Christmas Day, while most Australians eat and enjoy, it will, at Baxter, be a day no different from the day before or the day after. Even murderers and rapists in Australian prisons receive a Christmas meal." "Refugee advocates Project SafeCom expresses shock and horror this morning about the "snatching in Gestapo style" of the Bakhtiyari children and their mother at dawn this morning from their home in Adelaide." "Australia is not NAZI Germany, and the Australian public - if it were not manipulated by the Howard government, the previous immigration Minister Philip Ruddock and the current Minister Amanda Vanstone - would be likewise expressing their abhorrence with the way DIMIA Compliance runs its own Kingdom, void of accountability. DIMIA Compliance can well be compared to the Gestapo in Germany during World War Two." "First, DIMIA has shown time and again that it does not have the qualifications for precise, accurate and non-biased language assessment of asylum seekers, in order to determine nationality beyond any doubt." "The fact that in the end DIMIA had to call on the expert help of Canberra-based Migration Agent Marion Le who determined that many who were named as "Pakistanis" by DIMIA, were in fact Afghanis, shows the lack of skill and the presence of politically driven bias in these assessments if they are left to DIMIA. Ms Le also disproved DIMIA's claim and showed that her Tasmanian client Mr "S" was not at all Mr Bakhtiyari's brother. Recently, the Australian Financial Review has pointed to the fact that DIMIA used seriously biased agents, members of the Taliban , to assist them in nationality assessments of certain population groups from Afghanistan." "Secondly, the Bakhtiyari family's case credibility has been actively undermined through the vilification of the former Immigration Minister Philip Ruddock, who built his case against the family in what could well be described as "collusion with the media" after journalists of various Australian media outlets went on a witch-hunt, not as independent investigative journalists, but as sensational evidence-hunters, spending tens of thousands of dollars on overseas trips to prove Mr Bakhtiyari was from Pakistan; this media feeding frenzy was intensified after two of the boys escaped from the Woomera detention centre a few years ago - the next week Minister Ruddock claimed that a multitude of asylum claimants from Afghanistan were in fact Pakistani." "While the facts show that Ruddock engaged in sensationalist vilification, while the evidence could not verify his statements, Australians are yet to see an apology from the former immigration Minister." "Project SafeCom finds itself horrified by this renewed human rights breach of locking up children, and also other groups such as the South Australian group Justice for Asylum Seekers has expressed its deep concern with this situation." Project SafeCom wonders why this snatching in Gestapo style needs to take place so suddenly. "Did the nationality assessment of the Bakhtiyari family perhaps take place by questionable means, so DIMIA want them out of the country before this news leaks to the media? ", spokesman Jack Smit commented this morning. ChilOut is outraged by the Australian government's treatment of an Afghan family of seven who have been seeking asylum for the past four years. At 7 o'clock this morning, the mother, five children and baby were forcibly transferred to Port Augusta's immigration detention centre. They fear that they will be deported to Pakistan tonight. Grave fears are held for the family's safety. ChilOut and other human rights agencies are alerting international bodies such as the Red Cross, UN High Commissioner for Refugees and UNICEF that Australia may dump an extremely vulnerable refugee family in Pakistan. ChilOut is appalled by the Minister for Immigration's justification for her Department's treatment of the Bakhtiyaris this morning. The Minister claims that the family were given notice that there would be a change in their detention arrangements - but if this was the case then why did they need to be woken from their beds and forced into a vehicle at 7am? How is it that none of the South Australian government officials entrusted with their care for the past two years were aware of today's move? "The human cost of our refugee status determination system has been disastrous. The children's experiences in Australia - being caught in terrifying riots with uniformed guards wielding batons, tear gas and water cannon - expose a government policy that ignores its duty to act in the best interests of the child," ChilOut spokesperson, Dianne Hiles, said today. Apart from the above experiences, during their two years at Woomera, the older boys stitched their lips and went on hunger strike, escaped and were captured and redetained. Numerous child psychiatrists urged the Government to release the whole family from detention for the children's sake, to no avail. Ms Hiles said, 'It is to our great shame that the whole case has been politicised to the detriment of six vulnerable children. You would think we'd be able to find it in our hearts to give the family an amnesty at this time of year." THE Federal Government told a family of asylum seekers to get out of Australia after moving them today from suburban Adelaide to immigration housing in South Australia's north. Roqia Bakhtiyari and her six children were sent to Port Augusta today during an early morning immigration department operation. They were given no time to pack belongings. Her husband, Ali, remains at the Baxter detention centre on Port Augusta's outskirts, where more than 20 Iranians have been on a hunger strike for about two weeks. Mrs Bakhtiyari and her children had been living in suburban Adelaide, despite the Government having refused all family members refugee status. The family says it is from Afghanistan, but the Government maintains it is from Pakistan and can safely return. Immigration Minister Amanda Vanstone said the living arrangements of the family had become "untenable" but refused to elaborate. Senator Vanstone defended the haste of the Bakhtiyaris' removal to Port Augusta today and would not say if it was a step towards deportation, instead asking the family to voluntarily depart. The family had cost taxpayers more than $500,000 in having 20 claims heard and refused by the courts, she said. "What I think is appropriate is the Bakhtiyari family accept that they have had a fair go in Australia, all their claims have been considered, that they accept that and simply choose to go," Senator Vanstone said. "If they don't choose to do that, removal is an option that can be considered. This family has been given every opportunity. They should recognise the reality that Australia has been very fair and they have had a very, very fair hearing, but haven't been successful. It's time to face that reality, and go." The family's plight attracted international attention in 2002 when, during a mass escape from the now defunct Woomera detention centre, two of the children fled to Melbourne where they sought refuge in the British consulate. Meanwhile, Senator Vanstone said the actions of Iranians on a hunger strike inside the Baxter facility were "futile". "The Government abhors these sorts of actions," she said. "The detainees who are engaging in the action are not refugees. I strongly urge all those still involved in this futile action to cease immediately." Three Iranians yesterday came down after spending more than a week on a rooftop at Baxter. Others have stitched their lips in a hunger strike which began two weeks ago and has involved up to 27 detainees, according to refugee advocates. Federal Immigration Minister Amanda Vanstone has defended the way high-profile asylum seekers, the Bakhtiyari family, were ejected from their Adelaide home of 14 months. Immigration officials went to the Bakhtiyari family home at 7:00am ACDT to collect the family and take them to the Residential Housing Project at Port Augusta, in South Australia's north. A spokesman for the family says Immigration Department officials turned up at the house unannounced this morning and made the family leave immediately in two cars. They claim the family was not allowed to pack belongings and mobile phones were confiscated. But Senator Vanstone says the current arrangements for the family have become untenable for the Australian Government. She says the South Australian Government agrees with the latest move. Senator Vanstone is also not ruling out the possibility that the family will be deported before Christmas and has rejected claims that the Bakhtiyaris were caught unaware this morning. "They were given notice on Wednesday night that the current arrangements would be changed, probably in about 48 hours," she said. The family has been seeking asylum in Australia, saying they were from Afghanistan. However, the Australian Government insists they are from Pakistan. Their much-publicised bid for freedom received a setback when the High Court rejected their last appeal this week. Greg Kelly, the principal of St Ignatius College where the two eldest Bakhtiyari boys have been studying, is upset the Federal Government has acted a week before Christmas. "It couldn't be worse, there's a Merry Christmas sign on the front door," he said. "They're talking about where they'd have Christmas dinner. "To do this at Christmas, I mean there is another family that was in similar circumstances... Jesus, Mary and Joseph were also refugees at this time of the year." "The Prime Minister said [when] claiming election victory that he hoped Australia would be a beacon of hope and a beacon of tolerance. "Certainly, Amanda Vanstone has been more compassionate than the predecessor. I thought she was more compassionate than she's turned out to be." Queensland Democrats Senator Andrew Bartlett has gone on a hunger strike in support of detainees in the Baxter detention centre. Several detainees at the centre started a hunger strike two weeks ago, saying they would prefer to die than stay in detention. Some of the detainees have since ended the protest and have been taken to hospital for treatment. Senator Bartlett says he wants the detainees to maintain hope. "Really what I want to do is simply indicate to people in detention that they have support in the Australian community," he said. "There are thousands of Australians who are doing what they can to help the detainees and refugees who are suffering because of unjust laws. "[We are trying to] send a message to the community that this is an incredibly serious situation." Immigration Minister Amanda Vanstone says there are signs the latest protest action which included a roof-top hunger strike by detainees at Baxter detention centre is waning. At one stage, the fortnight-long protest involved more than 20 detainees. Senator Vanstone says two men who have been treated at the Port Augusta Hospital for dehydration are being returned to the facility. She says others have come down from the roof of the gymnasium and another has unstitched his lips. "It does appear as though this protest may be dissipating as they all have in the past," she said. "During the time of these protests it's a very anxious time for the carers and the guards because they do have responsibility to look after people and it's an additional stress on the people to make sure that the people in their care are properly looked after." Australian Democrats Senator Andrew Bartlett says he will remain on a hunger strike as long as detainees at the Baxter detention centre in South Australia's north do. Several of the hunger strikers, including those on the roof of the centre, have ended their strike, although refugee support groups say the protest is continuing inside. The Queensland Senator, who will drink water but not eat, says he is protesting about the conditions for asylum seekers in Baxter. "I'd also like to encourage the detainees to retain some hope," he said. "I don't encourage detainees to go on hunger strikes. "I've always encouraged them in the past not to do that, to pursue other means and I continue to encourage them not to do that but to indicate to them that we'll continue to support them." Meanwhile, Senator Bartlett says the Federal Government's treatment of the Bakhtiyari family has been unjust and a disgrace. Immigration officials arrived unannounced at the Adelaide home of Mrs Bakhtiyari and her six children early yesterday morning and moved them to secure housing at Port Augusta. The Government has not said wether they will be deported, but says it had become untenable to allow them to continue to live in the eastern suburbs home. "The Government and the department act close to Christmas, act in the night, act on the weekends and attempt to try and get away with what they're doing with less scrutiny," Senator Bartlett said. "Part of my job is to highlight what they're doing and ensure there is scrutiny of incredibly callous an inhumane acts." Senator Andrew Bartlett has said he will continue his fast in support of the Iranians locked up in Baxter detention centre. "Whilst I was initially only planning to fast for a couple of days, I do believe it is important to stress how very serious the situation is and how completely desperate the people in detention are," Senator Bartlett said. "I have not said I will hunger strike for as long as the detainees do. I will take it one day at a time in deciding what is best, but what I have said is that I will continue to support them, as do many thousands of people in the Australian community, in their struggle for justice and freedom. "I do not encourage people in detention to engage in hunger strikes, as it risks causing them serious self-harm and I continue to encourage those people in Baxter to resume eating. They have already shown their strength and determination, and many Australians are even more committed to do what they can to help them. "However, whilst I do not encourage self-harm, it is very important to continue to show support for them and to try to demonstrate to the wider public just how incredibly serious the situation they face is." "The asylum seekers are faced with a so-called 'choice' between perpetual imprisonment and serious persecution. Some have already been locked up for over 5 years for committing no crime. In such a situation, it is not surprising that people will resort to desperate measures." "Showing solidarity with the asylum seekers is one measure that can prevent them from giving up hope all together, which would risk more dire consequences. What they do should be a decision entirely for them, which is why I do not want to link my decision on fasting to theirs." "The Australian Government must take the simple step of acknowledging that our law has led to a grossly unjust situation. A recent report by the Edmund Rice Centre has shown that many asylum seekers deported have been persecuted on their return. Iran is a country with one the worst human rights records in the world and we should not be returning people to such a situation. HE has protested to save battery hens, bungy-jumped for votes, and played keyboard to rock against Prime Minister John Howard. Now Queensland Senator Andrew Bartlett, deputy leader of the Australian Democrats, is on a hunger strike to highlight the plight of Iranian refugees at South Australia's Baxter detention centre, near Port Augusta. Immigration Minister Senator Amanda Vanstone yesterday labelled his actions as foolish. But Senator Bartlett said that desperate times called for desperate measures, and he wanted to highlight the desperate situation of people in detention. Senator Bartlett said he would take his fast one day at a time. Refugee advocates claim more than 25 detainees have been refusing food for about two weeks at the detention centre. Three of the Iranian detainees have now ended their hunger strike after spending more than a week on the rooftop at Baxter. Others have sewn their lips together. Despite not eating since Friday, Senator Bartlett said: "I do not encourage people in detention to engage in hunger strikes, as it risks causing them serious self-harm, and I continue to encourage those people in Baxter to resume eating." Senator Bartlett said Iran had one of the worst human rights records in the world and Australia should not be returning people to such a dangerous situation. He said it was a concern that the High Court had confirmed that the Federal Government could detain people indefinitely. Refugee Action Collective spokesman Ian Rintoul applauded Senator Bartlett's protest actions. "It has been the case that previous groups of people have taken measures like this to highlight the difficulty (of those in detention) and to mobilise community support and to urge the Government to act compassionately," Mr Rintoul said. Senator Vanstone said: "For a Member of Parliament to engage in such an action sends a message to people both inside and outside immigration detention that a hunger strike is an acceptable form of protest. "Given the potential health risks to individuals, it's not an acceptable form of protest and so it's a very foolish thing for Senator Bartlett to do." Senator Bartlett said he was not going to do anything that would harm himself. He said people had tried everything inside and outside of parliament to end the absurdity of locking people up for more than five years, and desperate measures were needed to attract attention. The hunger strike follows a tough 12 months for the Queensland senator. He gained notoriety last year when he manhandled and verbally abused Liberal senator Jeannie Ferris in the Senate chamber. He later admitted a problem with alcohol and depression. As the Democrats eighth leader, he oversaw the party's worst ever election performance. Five days ago he officially handed over the leadership to Victorian Senator Lyn Allison, and he became deputy. Last Christmas the then Democrats leader Andrew Bartlett gave up alcohol after a fracas with a government Senator; this Christmas he is giving up food. Senator Bartlett's abstinence is to show solidarity with the long-term detainees at Baxter Detention centre, about 20 of whom are on hunger strikes in protest against their detention and the possibility some will be deported to Iran. Senator Bartlett told the Herald he began his fast on Friday night and was only consuming water and other fluids. He would not say how long his fast would continue, but that he would take things "day to day". He said he did not "encourage people to engage in acts of self- harm", and that he would not do anything harmful to himself. IMMIGRATION Minister Amanda Vanstone has criticised Australian Democrats senator Andrew Bartlett for staging a hunger strike. Senator Bartlett says he has not eaten since Friday night in support of a hunger strike by asylum seekers at the Baxter Detention Centre. Senator Vanstone today said there were health risk associated with such action. "Hunger strikes are not a good idea, there are health risks and I don't think a member of parliament should be setting that sort of example," she said on ABC radio. "I don't like the idea of kids, teenagers or adults learning from a member of parliament that this is an acceptable form of protest." Senator Bartlett says his protest is against conditions at the Baxter facility, near Port Augusta in South Australia. Up to 27 detainees have been involved in a hunger strike that began two weeks ago, according to refugee advocates, but three Iranians ended their strike on Friday after spending more than a week on a rooftop at the centre. Others have stitched their lips together. What's New at Project SafeCom? What are these orange buttons?